This former farmhouse cottage 'Buitenleven' was rebuilt in 1970 and since 2009 renovated by us with attention to detail and to original templates. The result is 3 stylish bedrooms, 2 modern bathrooms with shower and WC, and separate WC. The aim of the new design of the house was to combine the modern, minimalist design with the highlights of the Broeker tradition. A fully equipped kitchen with large dining tables makes you want to cook together and socialize. The living rooms also offer plenty of space and invite you to cozy hours in front of the fireplace. For music lovers there is a piano as well as a classic CD collection. In the living room, next to the supermodern, comfortable sofa is a large flat screen. Directly from the living room you can open the window doors to the beautiful south garden. You will find peace and relaxation as well as plenty of space for a common barbecue in warm summer summers. Children are welcome. At the front and back of the house enjoy a clear view of the meadows, where cows and sheep graze in the fresh green. Our garden borders on a wide moat. In this beautiful quiet part of Waterland you can go very well cycling, hiking and canoeing. Here one comes to rest! Our 'Haussee', the IJsselsee, park Hemmeland, is by bike on paths 3km through meadows and fields lead in 15 minutes to reach. In the summer, bathing, secluded beaches special for children are suitable. Monnickendam (about 4 km away) offers you shopping and gastronomy. You can only have a nice holiday with us if you arrive by car. Just write an e-mail with your e-mail address and phone number please. This former peasant house was rebuilt in 1970 and renovated in 2009 with attention to detail and according to the original templates. The result are three stylish bedrooms, 2 modern bathrooms with shower, basin and separate toilet. Goal in the redesign of the building was to combine the modern, minimalist design with highlights of Broeker tradition. A fully equipped kitchen with large dining table make you want to cook together and socialize. Also the living room offers plenty of space and invite you into hours before the fireplace. For music lovers, there is a piano and a classical CD collection. The living room is adjacent to the super modern, comfortable sofa,a large flat screen TV. Directly from the living room, the windows can be opened to the beautiful South gardens. You can find peace and relaxation as well as plenty of space for a barbecue on summer evenings. Children are welcome Included are wireless. At the front and back of the house you can enjoy unobstructed views of the meadows where cows and sheep graze in the fresh green. In this beautiful quiet part of Waterland you can very well cycling, hiking and canoeing. Here you come to peace! Clear air - clean environment, swimming, surfing, Keitsurf school, sailing, golfing, biking (free use our bicycles) on excellent trails, cozy Old Town area Our 'house lake' IJsselmeer, Park Hemmeland is, with the bike on the trails through meadows and fields run 3km in 15 minutes reach. Swim in the summer, secluded beaches special look suitable for children. Monnickendam (about 4 miles) offers shops and restaurants. The apartment is located 13 kmnorth of the center of Amsterdam, with its good traffic connections to the optimal mix between nocturnal rest and close to the sights. After a long day with countless impressions of the city you can relax in a novel or a good movie or sharing on the internet your experiences with friends in the cozy living room. We have lived in this little paradise over 30 years. So quiet, many different birds and pets, nice people, many hikers and canoeists, people who love life and enjoy nature. That's what fascinates us, and we think that other people can take advantage of that. 2 x Modern Bathroom with Shower, sink and toilet. Separate toilet in the hall. Lovely spacious comfortable cottage. Marvellous garden. The spectacular sunset from the deck at the end of the garden ended our days perfectly. This house exceeded our expectations. The booking process and directions were very clear and straightforward and I received some helpful emails from Caroline before leaving the UK. The house was very clean and extremely well equipped. The lovely neighbour, Rob, welcomed us and showed us around. There were thoughtful touches such as a welcome gift of wine and biscuits and plenty of consumables such as dishwasher tablets, herbs, oil, foil etc to make life a bit easier! The garden was fantastic with lots of lovely plants, seating areas and great access to the water for our canoes. We enjoyed paddling around the waterways and watching boats go by. We went on a couple of trips using the bikes provided at the house to Monnickendam and Maarken which was great fun. We went to Amsterdam a couple of times using the free ferry service, visited Edam cheese market and enjoyed a day at Hoge Veluwe National park with the free white bikes. We had a fantastic week and would love to return to the Waterland area. We spent a wonderfoul week in this great house with our 2 kids (4 and 7 years old). The house is very well equiped in a very peacefull environment, you will see all kinds of birds during your stay in this nature paradise, you can even enjoy the barque to go around starting from the garden. The house is very close to a school in which we enjoy the playground with other kids of the village, very cool for our childeren to meet others kids. So many things to discover around by bike, by the way the house was rent with plenty of bikes that you can enjoy. We also enjoyed to get to Amsterdam without any stress with a boat that you can take few km from the house and getting in Amsterdam downtown in 45mn from house door ( thanks Caroline for the tip). We are used to rent houses for many years and this one is definitevely one of the best we experienced. In the picturesque village Zuiderwoude, situated in the beautiful Waterland, we stayed in this lovely house. The house is well equipped with large bedrooms that have lovely views across the fields. The comfortable and cosy living room and furniture is perfect. We found the bathrooms, including showers and plumbing, to be nice and clean. Waking up in the morning and looking at ducks, sheep and herons just outside the window was charming and relaxing. The same when sitting in the sun in the beautiful garden on the waterfront, with a cold beer, after a long day of seeing the exiting city. It is perfect for those who like cycling and walking in the countryside, we used the bicycles provided and stayed out all day visiting different places each time on very safe and well-marked cycle routes. 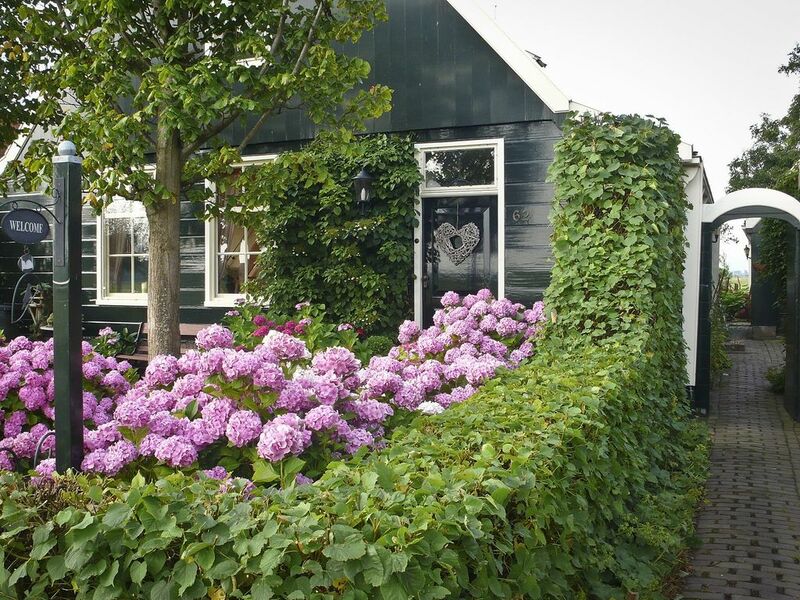 An ideal place to stay to visit all the charming towns in the Waterland region. We also took a day trip to Amsterdam parking near the ferry (7,80 a day ticket) to avoid driving in Amsterdam. For children there is a very nice park in Monnickendam, behind the dike, with little nice beaches for swimming and play football. Restaurants are nearby, we can recommend the pancake house in Broek in Waterland, and the fish restaurant in Monnickendam. We definitely will come back. Es war alles wie wir es uns vorgestellt haben. Das Haus ist etwas ganz Besonderes - ein toller Garten mit herrlichen Blumen und direkt am kleinen Kanal. Schöner weiter Blick in die Natur - Vögel , Hasen, Kühe, Schafe. Tolle Ausstattung. Amsterdam ist sehr gut ohne Auto erreichbar. Gut zum Fahrradfahren. Sehr nette Vermieter. Our garden is bordered by a wide moat.